This is a chart for the day President Truman signed the law creating the National Security Agency. 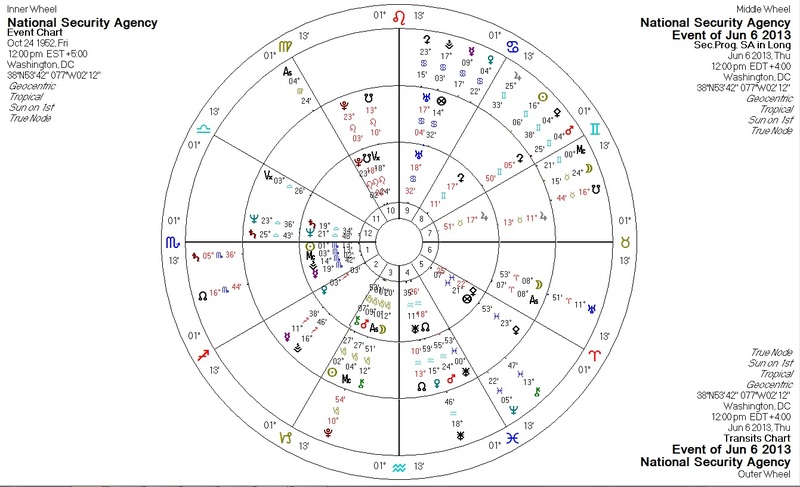 It's as close as I can get to a "birth chart" for the New Stasi of Amerika. Even without a time of birth, the chart gives us some interesting insight into the mysterious entity that apparently knows everything about us. Surprisingly, the chart is not entirely authoritarian. Pallas is trine Mercury. Her co-ruler Jupiter is opposite Mercury and her other co-ruler Neptune is widely conjunct the Sun and trine the North Node. On the authoritarian side of spectrum, Pallas co-ruler Jupiter is parallel with the South Node, co-ruler Neptune is sextile Pluto, and Pallas herself is quincunx Pluto. The Pluto factors should weaken over time: Pluto is with the South Node. I have a suspicion that authoritarian entities created by governments may self-destruct if their charts aren't "authoritarian" enough. I cite the Agricultural Adjustment Act of 1933 which has Pallas conjunct the North Node: the law was found unconstitutional after three years. The massive public leakage of NSA programs and the current snafu with the Utah data center may be symptoms of this syndrome. 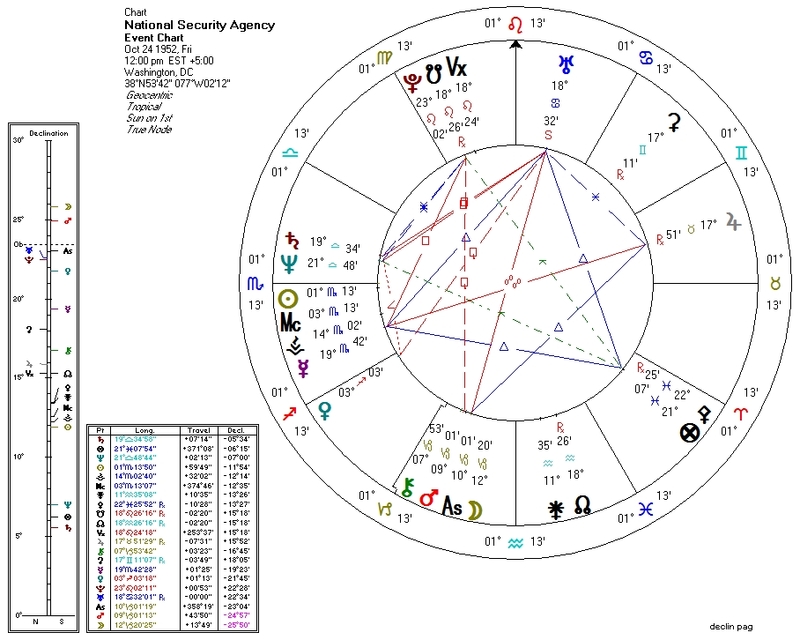 Even the Pluto/South-Node conjunction by itself (with Pluto ruling the Sun and Mercury) does not bode well for an agency tasked with secrets and power. Saturn conjunct Neptune, widely conjunct Sun, quincunx Pallas: the purpose of the entity is the fortification of secrets, something which it has done very well until very recently. Mercury square the Nodes and Pluto: very pronounced focus on information and communication, particularly of the hidden kind involving political power. Sun and Mercury in Scorpio: secrets and power are the raison d'etre of the agency. Those, and perhaps betrayal. Mercury trine Uranus: information through technology. Mercury opposite Jupiter: spying on the public without its consent? May also reflect how the public mission of the agency ("national security") is diametrically opposed to what it actually does with its brainpower. This is the NSA chart with transits and progressions for the June 6 2013 press leakage of public spying programs. The slower planets have not moved much since then. Transiting Pluto is conjunct the NSA's Mars, and transiting Uranus is squaring it. Because Mars co-rules the Sun and Mercury, this is a bit catastrophic. The agency's ability to exist and do it's job is under attack. This transit probably reflects both the press leak and the data center troubles. Transiting Neptune square NSA Venus: liquefaction of resources. This may reflect the Utah data center, as well as secrets in general (Venus rules the NSA Neptune). Transiting South Node conjunct NSA Jupiter: bad PR. Progressed Sun conjoining NSA Chiron: over the next few years, a lot of repair will need to happen. 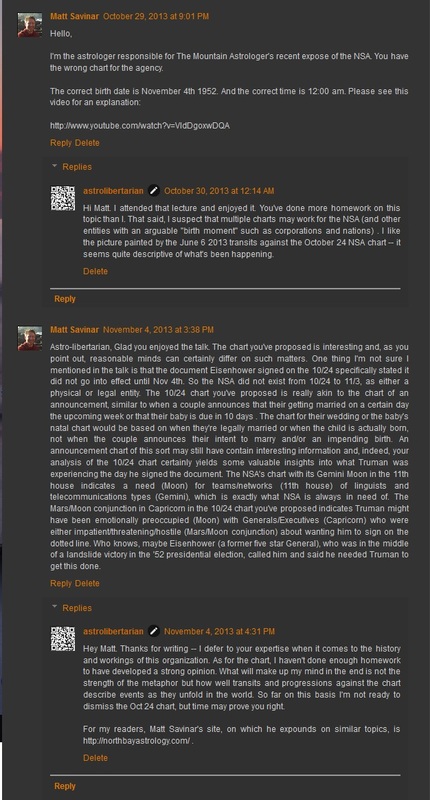 Saturn conjunct NSA Sun: a challenging time altogether.